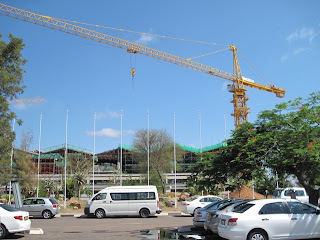 Gaborone, Botswana is a place of many contradictions, and this is what fascinated me most over the brief time that I spent there. These contradictions really hit home as we crossed town on our way to Bones' shop. 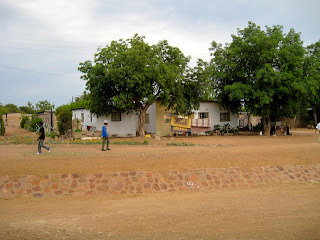 In the space of a half-hour drive, we passed through entire neighborhoods of corrugated metal shacks and dirt roads with chickens and children playing in the dust. There were shells of stripped cars on the sides of these roads, and everywhere there were people walking. And walking, and walking, and walking, sometimes with their burdens of goods balanced impossibly on their heads. Yet directly adjacent to these places were areas of dramatic development and, frankly, consumerism gone wild. There were strip malls, indoor malls, car dealerships, and billboards everywhere in Gabs. Many of the residential neighborhoods looked like lower middle class U.S. suburbs in fact, and there was, to me, an almost shocking amount of construction going on. All over the city there were buildings and roads being built. Development in Gabs was very clearly on the rise. 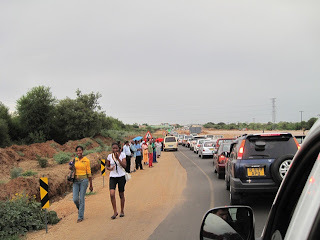 A side effect of this situation that was extremely relevant to our mission was the traffic. Some of the traffic jams we encountered, particularly when you compare them to the lack of population density, were just horrendous. It could easily take an hour to go 10 miles at the wrong time of day. And the lines for the combi transporters, which are privately owned vans that serve as public transit in Gabs, sometimes stretched for hundreds of yards (or meters, as it were). These lines were where people waited to pack into the combis and sit in traffic just like we were doing. With public transit in this kind of state, it quickly became clear why there were so many people walking everywhere. 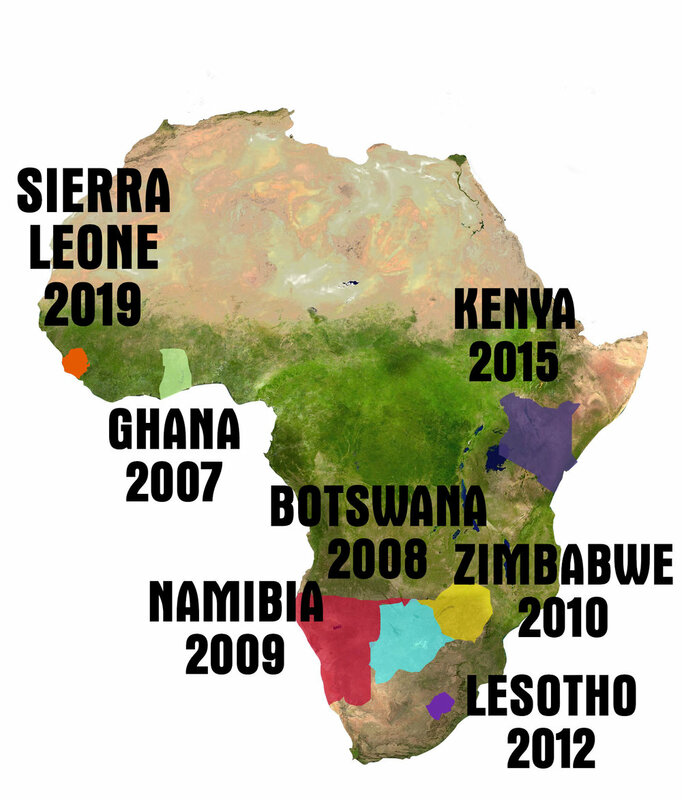 Despite the fact that the city of Gaborone is very low-density and very spread out—meaning that it would probably take a very long time to get where you're going—there were always throngs of people walking from place to place. One thing we saw almost none of, until we arrived at Bones' shop, were people on bicycles. And yet, the city was in many ways so utterly ready for this most perfect form of transportation. Almost all of the major thoroughfares were wide enough to allow bicycle traffic alongside the cars. In addition, there was an entire network of dirt paths along all of the major routes where people were walking. Most of these paths were easily wide enough to share with bikes. And unlike, say San Francisco, the city of Gaborone is utterly flat. One could ride across town to work without sweating any more than they would on an easy stroll. It was crystal clear to us that so many people here could have their lives completely transformed by a simple bicycle, and we needed to help Bones make that happen.